Easy to operate Windows based automated number plate printing system, created to suit all users. The most user friendly software on the market. All basic operations can be accessed from a single window. UK numberplate - allows the option of current format, Northern Ireland format and older letter suffix plates. All formats have the option of coachlines. Individual names and personalisations can be printed for one off pairs with pre-installed customers' graphics and BSAU logos. Euro Numberplate - allows the digits to be moved to one side for inclusion of Euro logo (GB ONLY). Can print consecutive plates allowing for exclusions of registrations not required. Database to record all plates generated recording data time, style pair, graphics, personalisation and user. PMA Xpress represents the ultimate in Number Plate Printing systems. Our user friendly on-screen layout makes number plate production simple. With an inbuilt audit log for ease of recording customer details, as required by current legislation, PMA Xpress can reduce your administration. 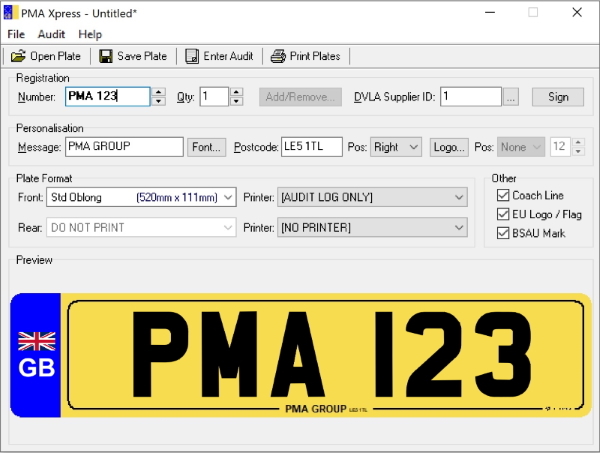 PMA Xpress allows all options of number plate formats including standard oblong, square, motorcycle, Euro logo plates and many more when used in conjunction with the correct printer and components. Variable heat settings on our thermal printers allow improved control over print quality where seasonal temperature changes are experienced. Our extensive stocks of materials are BSAU 145d compliant and can be delivered next day. The system also caters for the production of signs which can be used as showroom plates, reception area and car park signs etc. The use of different fonts maximise their impact. All O.E.M part numbers and vehicle information are for reference purposes only. Please contact us for further information if you are unsure on fitment.